Whilst promoting her new album ‘Phoenix,’ Rita Ora had no shortage of five major fashion moments in only three days. This comes after her dressy outing for ‘Live with Kelly and Ryan’. If you were loving every minute of that extravagant look, then just wait for this next set. Upon departing The Mercer Hotel in New York City on Monday (December 17), the songstress rocked a dramatic design from the Jean Paul Gaultier Fall 2018 Haute Couture collection. An avant-garde raincoat with the sharpest Le Smoking tailoring was served up here — with the bauble earrings, sci-fi sunglasses, and hot-pink lip only adding to the modern Matrix vibe. A union of delicacy and edge came forth in this Vera Wang Collection Spring 2019 broderie anglaise baby doll dress with exaggerated macramé lace sleeves, seen when Rita was at the Hearst Magazine Building later on Monday. I would owe some of that edginess to the leather OTK Clergerie ‘Alert’ boots, as her makeup reflected a softer tone. As Tuesday (December 18) was a new day, she departed The Mercer Hotel in NYC once again, this time in a Fendi Fall 2018 look. 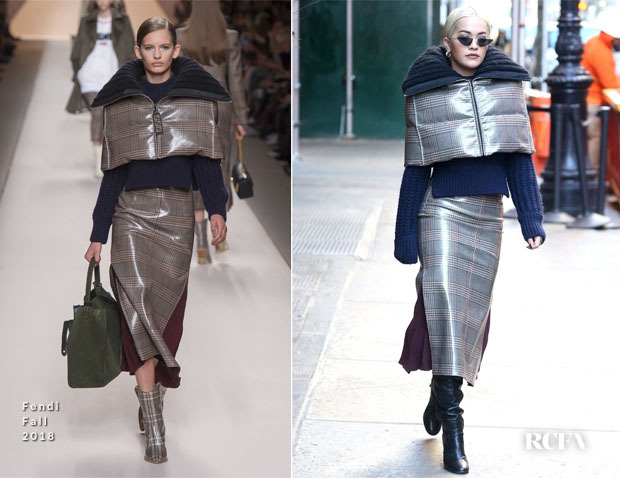 I love this ensemble for its vinyl-esque ode to plaid, the peek of plum fabric in the skirt slits — and for the ironic puffer cape. On some, this boxy ’40s-meets-futuristic look would just be silly. But, Rita pulls it off with serious aplomb. Upon returning to The Mercer Hotel later on Tuesday, she kept the play on proportions going strong with this puff-perfect Moncler 6 Noir Kei Ninomiya Fall 2018 flower-padded jacket. It was a statement in itself, but the Palm Angels Fall 2018 colour-block dress underneath and the white booties added even more attitude to the style-forward winter outing. The most precious of her edgy-experimental looks, this Dice Kayek Fall 2018 was debuted during the ‘C to You’ TV show in Paris, France on Wednesday (December 19). I love this on Rita, with the giant bow adding so much girly whimsy while the black-and-white palette ensures plenty of sophistication. Round sunnies added a retro element with Giuseppe Zanotti sandals to polish off the chic-sweet look.